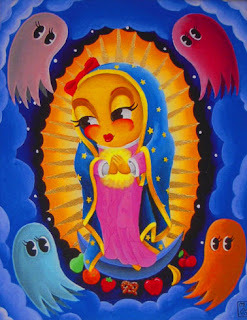 According to the folks at GameSetWatch, 50 8.5"-by-11" giclee prints of the piece--aptly titled, "Our Lady Of The Arcade"--are being sold by Los Angeles-based Gallery 1988 for $50. The boy would encourage me to buy that and put it in our apartment in the most easily visible part of our apartment. Yup. He loves that woman more than he loves me.